of April in an article written by: Stephen Shankland. Google for the first time showed off its server design. Google has hundreds of thousands of servers which have been designed and built by its own employees. Ben Jai is the main designer for these servers. Every server has its own 12-volt battery for supplying power in case of electricity disruption. Google’s power consumption has reached more than 99.9% efficiency. Google has the patent of build in battery design for servers. Google may consider licensing vendors. Google has data centers composed of 1AAA shipping containers packed with 1160 servers each. Every data center has many of such containers. Most companies buy servers from the likes of Dell, Hewlett-Packard, IBM, or Sun Microsystems. But Google, which has hundreds of thousands of servers and considers running them part of its core expertise, designs and builds its own. 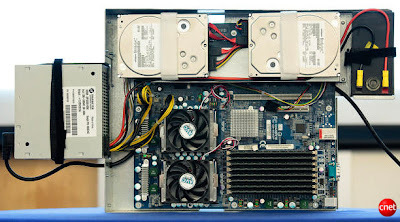 Ben Jai, who designed many of Google’s servers, unveiled a modern Google server before the hungry eyes of a technically sophisticated audience. It may sound geeky, but a number of attendees–the kind of folks who run data centers packed with thousands of servers for a living–were surprised not only by Google’s built-in battery approach, but by the fact that the company has kept it secret for years. Jai said in an interview that Google has been using the design since 2005 and now is in its sixth or seventh generation of design. Most people buy computers one at a time, but Google thinks on a very different scale. Jimmy Clidaras revealed that the core of the company’s data centers are composed of standard 1AAA shipping containers packed with 1,160 servers each, with many containers in each data center.